While creating an online presence for a website. Considering multiple support channels for engagement. The greater the supporting channels, the higher the chances of conversion rate. Rather than limiting it to few support channels through email and phone. Another much better idea of providing Live Chat can pay ways for many good customer engagements. Top reasons to have a live chat on your website. Live Chat support helps you to communicate immediately which ensures in quickly solving queries directly when the visitor is present on the website, and this would significantly increase the probability and conversion also. Every query is solved round the clock and this live chat is always helpful in answering the queries which are the credibility of your website. Each and every promotion of yours can be pop-up updates through LiveChat Integration. This would gradually increase the conversion rate of your website easily. So, when a visitor gets to know about the promotional offers and discounts, then the seller has 90% chances of selling a product because every buyer/visitor will land in your website with some intention of buying the product. Handling review in a much better way. Reviews are the most unavoidable inputs from the customer. Hence, through live chats, they can contact you directly instead of posting as a review which is actually an advantage to the company. This ensures the control over the negative comments and following up with the customer’s query received on chat is appreciatable and the customers would be pacified as well. When your customer spread across the world’s different location it’s difficult setting up with many branches across the world. In this case, Live chat is much easier for business to have a conversation with your customer around the globe. Live chat enables your visitors to interact instantly and easily, also increases customer satisfaction and make your business more credible before the customer. Having Live Chat service on your website is a win-win situation for you and your visitor. Spontaneity is the attractive feature, which is highly expected from anyone and the expectations increase especially in Business. Hence, Live chat solves all the problem regarding customer clarifications and engagements. 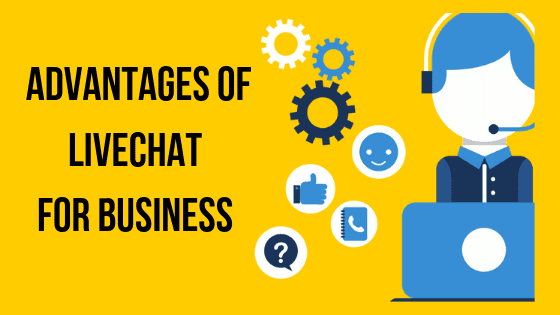 If you require any guidance in setting up a Livechat in your Website. We are glad in helping you.